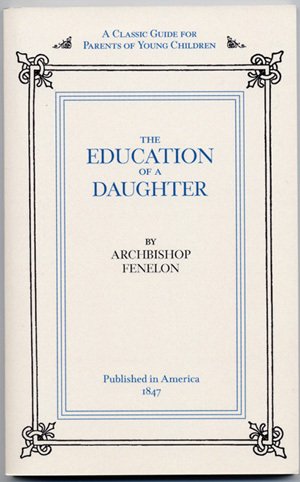 by Archbishop Fenelon (This is the anglicized version of his name. His full name was Francois de Salignac de la Mothe-Fenelon). This reproduction was originally published in English in the United States in 1847 although the original book was written around 1687 in French. There are some parts sure to get modern women disagreeing such as the statement "Women have generally minds more weak ... than men. Yet the author was more modern in urging that women get an education, albeit limited to that necessary to assist them in their duties assigned by the culture of the time. Like other advice books of generations past, there are some elements that are still applicable and other portions that are very out of date. As might be guessed, it would be considered very conservative in its philosophy. All in all, this book is an interesting look at some of the guidance available to parents of the mid- nineteenth century.